Kids of the ‘80s would have killed to be a Ghostbuster—and they almost got the chance. In a 2013 interview with 2600 Connection (which was discovered last year by /Film and started making the rounds on the Internet again earlier today), Roger Hector—who managed Atari's Advanced Products Group and later worked with companies like Electronic Arts, Walt Disney, Sega, and Namco Bandai—revealed that a Ghostbusters ride, called The Hauntington Hotel, was designed for Six Flags theme parks in the 1980s. The two-and-a-half-minute-long attraction was a combination dark ride and video game and, according to Hector, the first of its kind. 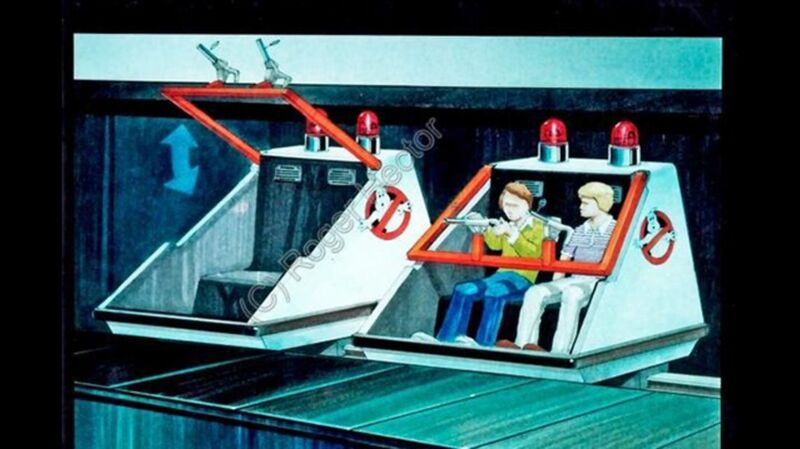 At the beginning of the ride, theme park visitors would have climbed into a Ghostmobile, which had a pull-down lap bar that was equipped with ghost-busting guns. The riders would then be told that they’d been recruited by the Ghostbusters Agency. Their first assignment? Clean up a hotel infested with ghosts. The ride took visitors down the hotel’s hallways and through its rooms, all peppered with ghostly targets that riders would have to eradicate, which "would react to being hit so the player could easily know when they got 'em," Hector said. At the end, they’d be scored on their ghostbusting performance. You can see tons more concept art at 2600 Connection.